•	Created two top Snaps — one that ran between Friend’s Stories and the other in various Publisher Stories. Maggi is a popular brand of cooking seasonings and sauces spicing up kitchens all over the world. Looking to appeal to a younger audience, as well as invite them to cook more often with their roommates, Maggi partnered with YouMiam to create “#CookTaColoc,” a web series about a French Food Tour. The series portrays a group of young people who share an apartment and cook together. Maggi turned to Snapchat to help drive awareness and generate video views among Snapchatters 18 and older. To entice Snapchatters to watch the Long-Form Video, Maggi created two top Snaps — one that ran between Friend’s Stories and the other in various Publisher Stories. In the Friend’s Stories top Snap, a young chef presented a dish and invited Snapchatters to swipe up to learn how it was prepared. 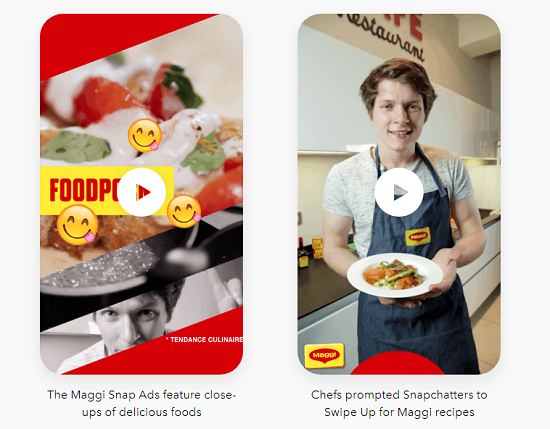 In the Publisher Stories ad, Maggi combined animated motion graphics and emojis with the same young chef, inviting Snapchatters to swipe up. The Maggi brand was present from the first second to the last, which helped drive brand recognition. Christelle Arrighi, Digital Manager, Nestle France, said: "Snapchat’s solutions allowed us to reach our audience in an agile and creative way. The Maggi brand was present from the first moment, which drove brand recognition and helped us demonstrate how culinary aids can enhance any meal."